упс! я сказал "я вижу", я хотел сказать "я живу". много ошибот граматических, даже не хочется разбирать. cursive is fine. Красивый почерк, к сожалению никогда не выучила как читать такие! by the way, d u mean WA state? If so, you want to say Я живу в штате Вашингтон. Otherwise, я живу в городе Вашингтон. Note that in the words мягких (line 2) and булок (line 3), you can clearly see the "hooks" I'm talking about. P.S. If you have trouble viewing the image, it says: Съешь же ещё этих мягких французких булок да выпей чаю! Which you can translate as "Eat up some more of these soft French loaves 'n' drink some tea!" Lampada and UhOhXplode like this. some longer words lack some strokes (грамматика, for example). Personally I am waiting with impatience when hand writing is prohibited. I get a stress every time I have to take a pen. @ McGee. Those hooks just solved my biggest issue with learning to use script. It was a nightmare dealing with г, и, л, м, and ш in single words. I'm definitely gonna start using those hooks. by the way, you don't have to connect the letters, it's possible to use them separately if it's easier (i.e. the connection lines between the letters are not a must, they just happen to be there as a natural way of writing by natives and with them the writing looks natural). Thanks for that information, Alexsms. I already found 2 lower-case letters that I probably won't connect - у and д. They look like the english y and g and I never connect those when I write in english script. I got determined to learn Russian script when I noticed that in text messages on Russian holiday cards, sometimes letters looked like script - the г, и, and т.
I also noticed on the 50 let Pobedy icebreaker, the л looks like the script л and the д is pointed at the top. But it got really strange when I was trying to read Russian commemorative coins. That's when I learned about the old Church Slavonic alphabet. Now I can read the coins too. Throbert McGee, UhOhXplode and archeria like this. In my first-year college Russian class, we were taught that the "hooks" are absolutely mandatory. 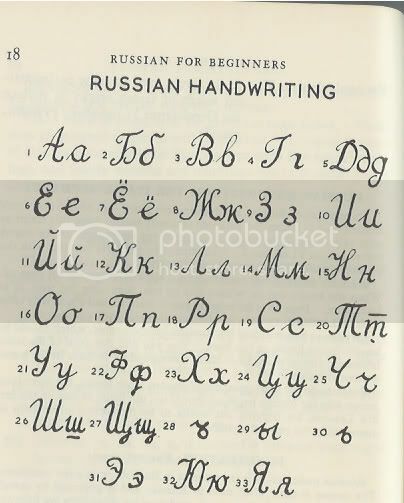 True, when native Russians are writing cursive in a quick-and-sloppy way, the hooks can be difficult to see, but they are not entirely omitted -- at the very least, there's a bit of an upward wiggle in the pen stroke. On the other hand, it's NOT mandatory -- but many people would recommend it -- to put a horizontal line over the m (i.e., the cursive т) and also under the cursive ш and щ. And some people put a very short horizontal stroke through the middle of the cursive ж, but as far as I know, this is less common. Съешь же ещё этих мягких французких булок да выпей чаю! Notice that when the one-syllable word да means "yes", it is always stressed -- when it's unstressed, the meaning is "and" or "but" or sometimes "let it be so" (Да будет свет, "Let there be light!"). On the other hand, the one-syllable emphatic particle же is NEVER stressed, as far as I know, while one-syllable pronoun forms such as я/мне, ты, он/им, ей, мы/нас/нам, вы/вас/вам, тот/та, etc., are ALWAYS stressed. P.S. Here's an image that shows the horizontal line over the lower-case т and under the lower-case ш (again, these are OPTIONAL, but recommended for easier reading) and also including the two variants for lower-case д (you can write it either as "g" or "a backwards 6"). I greatly recommend this page because the animations show you the ideal order to make the pen strokes! Russian folk song "The cattails/water-reeds were rustling (lit. "making noise")"
А ночка тёмная была And the night was dark. Гуляла до утра Strolling until morning. Помята девячья краса The damsel's beauty was disheveled, [too]. "Где ночь гуляла, с кем была?" "Where were you strolling [all] night, who were you with?" Домой тропинки не нашла." "And couldn't find the path home." And keep their secret scrupulously!